3-D Hand Control Master Cylinder. 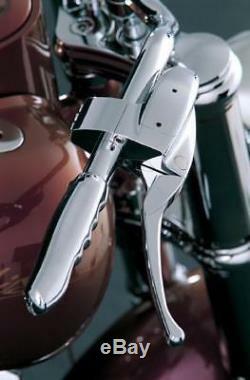 3D handlebar brake master cylinder. (Please note, picture shows 3). OMP hand controls are CNC machined with a manufacturing process which allows to cut billet aluminum with variable curving radiuses (3D machining): the result is a unique product with stunning design. Brake master cylinder comes with a 2-buttons switch clamp. 5/8 bore brake master cylinder for single disc and dual disc applications. The finest handlebar controls in Europe 3-D radius design adds the finishing touch to your handlebars Machined from 6061-T6 billet aluminum Master cylinder has 2 switch buttons Chrome finish NOTE: We suggest to use DOT 4 brake fluid only. In any case do not use silicone based oils. All items listed on outlawcycleproducts store are brand new and in their original packaging, unless otherwise clearly specified. Please include item number will all inquiries. Do not destroy the packaging or write on it. They can either replace or rebuild the part. The item "OMP 3-D CHROME HANDLEBAR HAND CONTROL MASTER CYLINDER HARLEY 5/8 BORE 08-835" is in sale since Thursday, December 14, 2017. This item is in the category "eBay Motors\Parts & Accessories\Motorcycle Parts\Handlebars, Grips & Levers\Other Handlebars & Levers". The seller is "outlawcycleproducts" and is located in Tarzana, California. This item can be shipped worldwide.